Cherrapunji is a village in Meghalaya, and is located on the Shillong Plateau about 55km southwest of Shillong, the state capital. We’re aware of how much rainfall it receives annually; it is one of the wettest places on Earth. Also known as the ‘Jewel Crest of Meghalaya’, Cherrapunji nestles in the East Khasi Hills and is home to the most gorgeous waterfalls, living bridges, limestone caves and sights you’d never find anywhere else in the country. Though monsoon is a great time to visit Cherrapunji for lush verdant greenery all around; visiting here during the winter months has its own charm. You must visit as many waterfalls as you can; especially Dain Thlen Falls, Nohsngithiang Falls and Nohkalikai Falls that are relatively easily accessible. Stunning caves are worth a visit as well – Mawsmai Cave especially which offers a thrilling experience, because it’s truly a wonderful work of nature. It is lit up with halogen lamps, is 820 ft long, and is located at a distance of about six kilometres from the town. Then the Krem Mawmluh Cave is also quite something being the fourth longest cave with a pool inside it formed because of five different rivers. 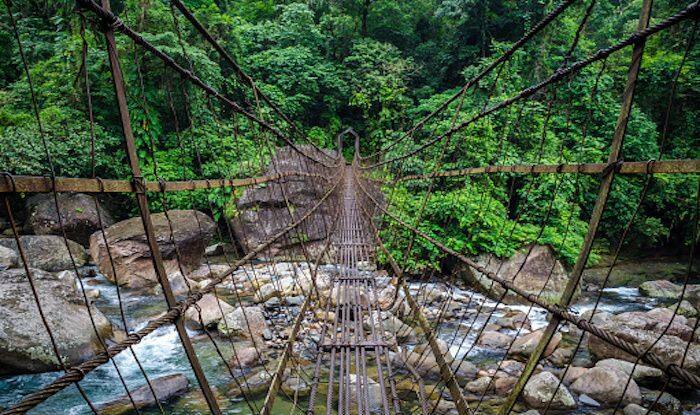 How can we not mention the Living bridges of Cherrapunji. The reason why they’re so talked about is that they are not built but grown by the local people. Secondary roots of Ficus Elastica tree that grows above the ground surface are used for making living bridges. Though the living bridges take about 10-15 years to build, they last for more than hundreds of years. One of the oldest living bridges in Cherrapunji is 500 years old and still in use. You must visit the Umshiang Double-Decker Root Bridge – one-of-a kind in the entire world – where it has two bridges one above the another. Cherrapunji is inhabited mainly by the Khasi peoples, who are largely Christians and go by a matriarchal social system. Interacting with the locals can turn out to be an experience of its own. You could also visit near-by places from Cherrapunji such as the beautiful green Umngot river of Dawki or the quaint village of Mawlynnong, known as Asia’s cleanest village.